The Grotte De Bethlehem is located on the cliffside just outside of the small town of Ussat in the Ariege Region. 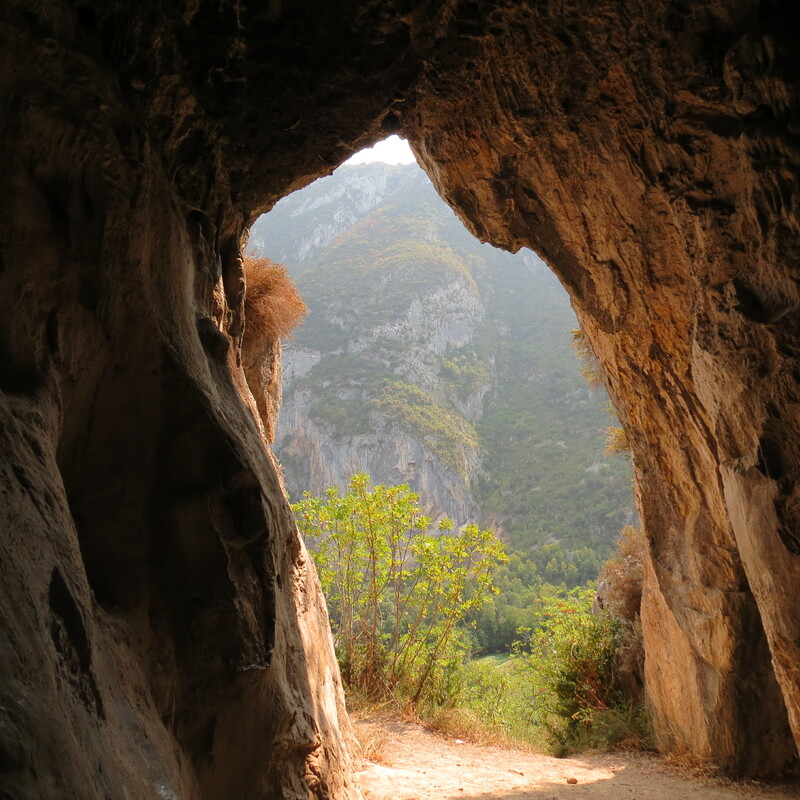 The cave is nearby Monsegur as it was an sacred place of the Cathar people who lived in the area. They likely traveled from Monsegur through the mountain pass near Pic De La Saint Bethelemy on a strenuous twenty kilometer hike. We traveled through Lavenet, nearby Monsegur to Foix and then up into the higher elevations of the Pyrenees as if traveling to Andorra. A few miles up the road was the mountain valley town of Ussat, likely a place of farming and mining for the Cathar people. Once in the town of Ussat we traveled up a hiking trail along the cliffside. I was fortunate to have a guide as the path did not have signs directing the way. However it was a good trail, but very steep for two hundred yards. Once entering into the cave it felt like a blast of a higher energy hitting me and I felt the pleasure of something highly expansive enter into me. There in this little chamber was a large rock, almost flat like a table, likely weighing two tons sitting in the middle on three rounded boulders. The energy of the place was all centered in this gigantic rock. My guide and I took turns lying on the rock, feeling an immense stream of light enter into us. I felt as if there were worlds of crystalline structures underneath the cave within the earth helping assist this profound flow. It was quite and experience as I lay on the rock for over an hour. Afterwards I felt a profound expansion alive within me for the next few days. My friends I was living with me at the time looked at me wondering what happened, I had too much bliss inside of me. The Grotte De Bethlehem is an intense experience, I have an understanding why this was considered one of the Cathars most sacred places. It is discreetly located so there is little traffic. It is one of the things I love about this region, some of the most profound places are not visited by many.